The FM Fire-Safe Electro-Thermal Link ball valve is activated by either heat or signal from smoke detector to dump flammable fluids to another source. The fire safe thermal shutoff closes to prevent fueling of a fire in petroleum and chemical processing plants. Evaluating EBVs on a cost basis using Dow’s Fire and Explosion Index methodology, an operation can save $350,000 on an installed plant valued at $5,000,000 – as well as save $300,000 per day of down time resulting from a leakage and potential fire incident. These savings are based on estimated damage value of 70% of installed value and a 10% savings from EBV/SIS systems, typical in the industry. Simple, proven, and Factory Mutual (FM) approved valve assemblies incorporate Emergency Block Valve (EBV) shutoffs with thermal, and even better — electro thermal shutoffs, such as the FM Fire-Safe Thermal and Electro-Thermal shutoffs, available from Assured Automation®. According to Henry Febo of Factory Mutual, thermal shut-offs are widely used and provide a generally accepted, inexpensive layer of safety. An automatic trigger to shut the flow of flammable media in the event of fire, answers the question, who turns off the fire-safe valve during a fire — the fusible link assembly automatically stops the flow of flammables. Although the usage of thermal shutoffs is relatively widespread in the industry, process designers are only beginning to learn about, and adopt electro-thermal shutoffs. This allows the EBV to be automatically shut off in response to a signal as well as in response to heat and manual manipulation. The electro component can be triggered by a number of sensors, including smoke detectors or pressure drops, adding another layer of automatic protection. The evidence is overwhelming regarding the value of safety systems in the production of chemicals, pharmaceuticals, oil, natural gas and diesel production, alternative fuels, paint and coatings, alcohol, adhesives and sealants, on tank farms and any manufacturing process that involves flammable liquids or gasses. And OSHA’s regulation on flammable liquids (29 CFR 1910.106(b)(4)(iv)(c)), API 553 standard, and NFPA 58 standard all recommend the use of emergency block valves for safety when designing systems for flammable media. John Murphy is a retired process safety engineer that worked for the Dow Chemical Company and as a lead investigator for the US Chemical Safety Board. He presently works as a consultant for the AIChE Center for Process Safety where he has managed several book projects on Layer of Protection Analysis (LOPA) and teaches Process Safety Boot Camp to companies around the world. Emergency Block Valves are used to control a hazardous incident. These are valves for emergency isolation and are designed to stop the uncontrolled release of flammable or toxic materials. 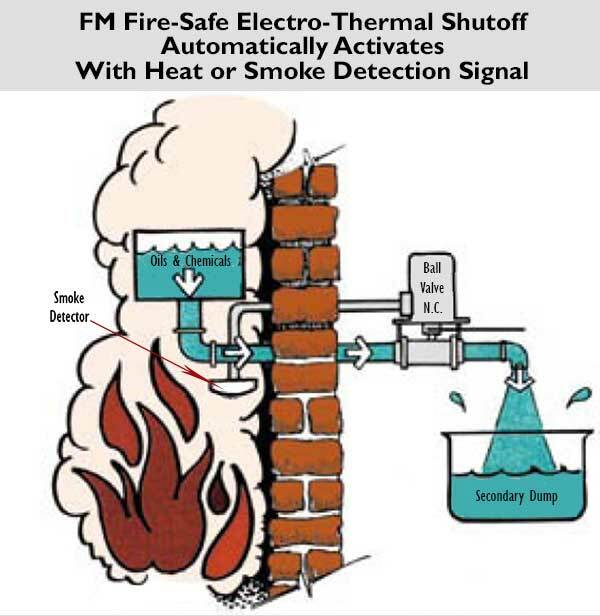 Automatic shutoff through thermal (fire) actuation. When fusible elements are used they shall have a melting point not exceeding 250°F. Manual shutoff from a remote location. Manual shutoff at the installed location. NOTE: The only proposed change is in section 3168 where the compliance date of December 31, 1978 is moved to December 31, 1980. A firesafe valve is one specifically designed for flammable liquid service and which can withstand a direct fire exposure of 15 minutes without excessive internal or external damage. This entry was posted in Biofuel Industry, Emergency and Fire Safety Valves and Devices, Flavor/Fragrance, Food/Beverage, Latest News, New Product Announcements, Pharmaceutical, Plastics, Specialty Products and tagged Automatic Gas Shutoffs, Fire Safety, Thermal Activated Gas Shutoffs. Bookmark the permalink.